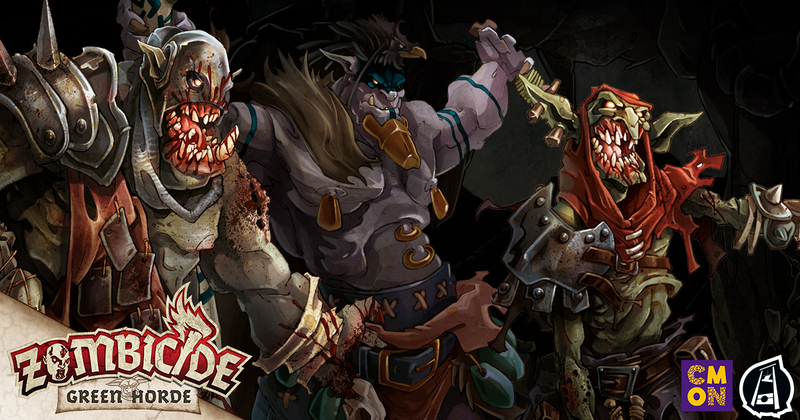 The heroes of Zombicide: Green Horde had been surviving long before the plague hit. They lived on the Western frontier, at the border of Orcish lands. It was a wild country with forests and fields overgrown with green and crawling with Orcs. In the generations before the plague hit, they had come to know their enemy well. However, the familiarity they had developed is not going to help them when the Green Horde arrives. Orcs are generally stronger than men, some even at birth. So it stands to reason that zombie Orcs are going to retain a lot of that strength. In Zombicide: Green Horde, the Survivors are going to face a challenge unlike any they have in the past. The zombies featured in Green Horde work similarly to the ones from Black Plague. They have one activation per turn, except for the speedy runners, who will get to act twice. Most of the undead Orcs are physically stronger than the average, human zombie, and they’ll inflict more damage on any Survivor unlucky enough to get too close. The new Orc Walkers are the reanimated corpses of the general grunt warriors from an Orc army. Despite their brutish nature, in life, these Orcs were quite cunning. They’d use their smarts to gain tactical advantages during raids or in battle. The plague has robbed them of more than their life. Now, they shuffle mindlessly among the fields, houses, and ruins. However, they do become more animated when a target crosses their path. Survivors best beware of Orc Walkers, as they still possess the strength of two men. These foes will be the ones the Survivors see the most of in Zombicide: Green Horde, but they’re just the start of the problem. The Orc Fatties used to lead the armies into battle. They were the shock troops, the enforcers, the bullies of the bunch. These obese green monsters are strong, even by Orc standards. They can slug a hole right through a man’s chest with a single punch. Survivors would be wise to give these giants a wide berth, and if they have to enter unexplored buildings with close quarters, they should definitely wear armor. Generations ago, an alliance was formed between the Orcs and the Goblins. The smaller cousin benefitted from the protection of the Orcs, and the Goblins were very useful for getting into tight spots, or sneaking away with loot. When plague hit the Orcs, it wasn’t long before the Goblin population was infected as well. The Goblins are the Runners of Zombicide: Green Horde. Even while becoming undead, they’ve retained their speed… and their survival instinct. The Runners in Green Horde aren’t as powerful as the Walkers, but there sure are a lot of them. They appear much more frequently than normal runners. In a flash, Survivors might find themselves surrounded by these speedy, unpredictable creatures. The Runners get two activations per round, and always seem to find a way to hide behind their beefier teammates when there is an attack incoming. “Orc Abomination” sounds a bit repetitive, but if you can believe it, these creatures are the epitome of raw power. Capable of ripping off a man’s arm, the Abominations are impervious to all but the most extreme damage. When Survivors spot an Abomination in a crowd of other zombies, they’d better start making plans immediately to destroy them, or run for their lives. An attack from an Orc Abomination can’t be prevented by armor rolls and to slay them, the Survivors will need a way to deal a lot of serious damage; maybe by setting them aflame with Dragon’s Fire, or crushing them with a giant boulder shot from a catapult. Y’know, whatever works. Behind the mindless hordes, hungry for human flesh, there is a force directing them. They were the ones that were silent as their own people were being corrupted by the plague. Now, they drive the Green Horde to attack at their command, using the infected Orcs as their own, personal weapon. These are the Orc Necromancers. Regardless of their powers, they are cowardly and weak when confronted. They will flee at the slightest provocation to ensure the plague continues to spread. Survivors should target them whenever possible. Further complicating matters for the Survivors is the ever-growing Horde. It waits, swelling in size, until its presence is triggered on to the board. The Horde is a swarm of zombies that may contain all shapes and sizes. When it makes an appearance in the game, players better be ready to react. Zombicide: Green Horde is full of nasty challenges for those not yet victimized by the plague. Destroying an undead human was tough enough, but zombie Orcs, devoid of emotion or remorse, make for brutal adversaries. The battle between the living and the dead is about to commence. Grab a sword and start hacking. It’s time for Zombicide! Zombicide: Green Horde is coming to Kickstarter on May 30, at 3 PM EST. Stay tuned to the CMON and Guillotine Games Facebook pages for all the updates!